Emails show state workers got purified water coolers in Flint. Mary Stewart pours bottled water to make coffee in her apartment on the north side on Jan. 21, 2016, in Flint, Michigan. The Flint, Michigan, water story gets worse by the day. Thursday’s new low for the city, state, and administration of Republican Gov. Rick Snyder is the revelation that while state officials were assuring Flint residents their water was safe to drink—which they did until October of last year—they were also busy installing purified water coolers in state office buildings in the city dating back to Jan. 7, 2015. Caleb Buhs, a spokesman for DTMB, said the water coolers were provided in response to the city health notice in late December or early January, which he acknowledged was about a contamination issue the city said had already subsided. The state continued to provide the coolers of purified water, right up to today, because “there were more findings as we went along,” Buhs said. Buhs said his department never told state workers the tap water was unsafe to drink, but only provided an alternative, as a landlord would do for tenants. Flint has been run since 2011 by emergency managers appointed by Snyder. In 2014, to save money, the city began using the polluted Flint River as its water source. The drinking water from this new source created a number of health threats, including high levels of lead. (Lead can leach into drinking water from lead pipes.) A study released in September 2015 concluded that the change has put Flint children at significantly increased risk of lead poisoning. 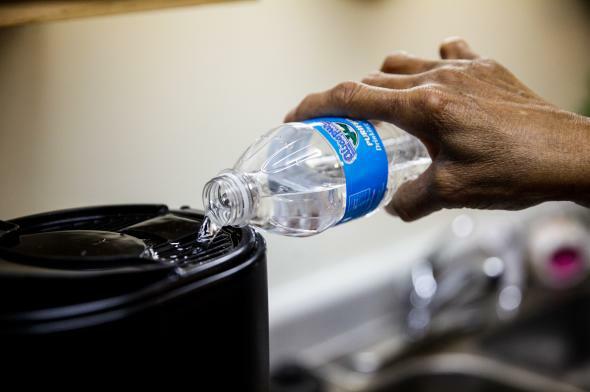 The city has now switched back to its old water supply, but lead levels are still high, and the state government is distributing bottled water to residents. On Jan. 5, Snyder declared a state of emergency to deal with Flint’s poisonous water supply, and later called in the Michigan National Guard to distribute bottled water.